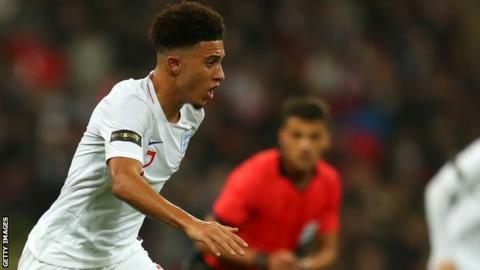 The Football Association is investigating claims that Manchester City made a banned payment of £200,000 to Jadon Sancho's agent when the England winger was 14 years old. The allegations were made in documents published by Der Spiegel. It is alleged City paid Emeka Obasi when they signed Sancho, now at Borussia Dortmund, from Watford in March 2015. Young players cannot be represented by an agent until the year they turn 16. A City statement read: "The attempt to damage the club's reputation is organised and clear. "We will not be providing any comment on out of context materials purported to have been hacked or stolen from City Football Group and Manchester City personnel and associated people." FA rules state that clubs are not permitted to offer financial inducements to a player under 16. The German magazine also says a City lawyer was "alarmed" that the letter could be deemed as a financial offer and therefore breaking the rules about offering inducements. Sancho never made a first-team appearance for City before moving to German side Dortmund for £8m in August 2017.